These stuffed peppers were a huge hit with everyone! Quick and easy to make they are savory and look great! We used a variety of different colored peppers and a barbecued beef and couscous filling that was super quick to prepare. Any color peppers can be used, and the filling can be made from TVP if desired for a vegetarian entree and leftover rice, barley, or other small pasta could be used in place of the couscous if desired. You could also use your family's favorite stuffed pepper filling if you think they would like it better than our "monster brain" filling. We also used uncooked peppers decorated in the same way to hold dips for vegetables and chips and they were a big hit too! Cut the tops off of each pepper and reserve the tops. Remove the veins and seeds from each pepper. Place the peppers cut side up in a shallow microwave safe dish and cover with plastic wrap. Pierce the plastic wrap with a fork. Microwave on high for 4 minutes. While the peppers are cooking, Heat the oil in a large skillet over medium high heat. Add the onion and sauté until translucent. Add the garlic and sauté for a minute and then add the ground beef. Brown the beef well, and then add the couscous and water. Bring to a boil and break up the couscous and beef into small pieces. Cook until the water has evaporated and add the barbecue sauce and enough blue food coloring to make a brown sauce that looks "monster brainy-ish" to you. (Our sauce was a rich purple that did not photograph well, but that our testers loved!) Heat the mixture through thoroughly. Stuff the peppers loosely with the filling and return to the shallow dish. 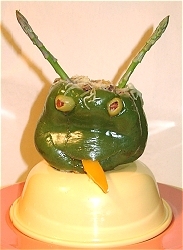 Sprinkle the cheese over top the "brains" and add two asparagus spears to each head. Microwave uncovered for 3 minutes on high, or until the cheese melts and the pepper is piping hot. 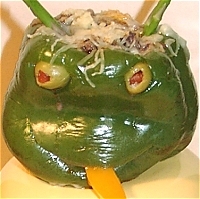 Make 2 small X's on the side of the pepper for the eyes and carefully add the green olives. Make a slit for the mouth, and cut tongues from the reserved pepper tops. Insert the tongues and serve hot.